Scottsdale and Tempe Arizona are known for their love of cars, and the many car shows held each year. In Scottsdale Arizona we have the Good American Legion Car and Bike Show, the All Oldsmobile Car Show, and the Russo and Steele Collector Automobile Auction to name a few. In addition, every Saturday at the Scottsdale Pavillions Shopping Center you can find the Rock and Roll Car and Bike Show. This is one of the biggest car and cycle shows in the United States, with hundreds of cars from every era, from early 1900s, to muscle cars, sports cars, and new cars. They also include every type of motorcycle, from Harleys, to Euro tourers, to customs. Each year Tempe Arizona holds the Catch a Wave Car Show at Kiwanis Park to benefit educational programs, and the TCH/The Centers for Habilitation car show to benefit individuals with disabilities and special needs. Most of these car shows have something for everyone including music, food, arts and crafts, and raffle prizes. Scottsdale Muffler and Automotive is a family owned and operated business that has been a leader in general car repair for over 20 years. In addition, we are also proficient in restoring and modifying classic and custom cars. If you have ever attended the Russo and Steele Classic Car Auction, you know the caliber of cars there. Our expert mechanics in Tempe is proud to have helped work on a beautiful 1966 Chevy Corvette which sold for $160,000 at the auction, an event which presents the opportunity to see and/or purchase some of the finest cars in the world. The 1966 Corvette has been one of the more sought after of the classic cars. Only 27,700 1966 Corvettes were produced, making it a rare find that any enthusiast would love to restore. Rebuilding such a car allows you to choose whether you want an original 327 small block, the 427 big block, or you can opt for a modern LS7. Whether you go with an original 4 speed transmission, the original Powerglide automatic transmission or a modern 6 speed that allows you to choose how you want to drive at the time, for power or for gas mileage, you can make the choices and we can do the work. In the 1966 Corvette mentioned above that sold at the Russo and Steele Classic Car Auction, the owner chose an LS7 engine, a 6 speed transmission, and even added a 2012 Chevy Corvette Rack and Pinion front suspension to hug every curve. 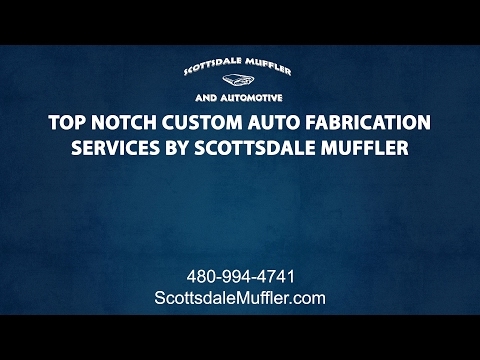 Scottsdale Muffler and Automotive also specialize in Custom auto fabrication. You can count on us for a variety of specialty automotive work, including top notch fabrication services, and installing aftermarket parts on regular cars and hot rods. Our shop even has the capability to extend the frame of your car if you want to customize it. We can also assist you in restoring your AZ classic car by repairing automobile parts if your goal is to keep it as original as possible. Whether you are interested in repairing, modifying, customizing, or rebuilding, your engine, frame, transmission, or exhaust, we have the capability and experience for the job. Furthermore, we know how to keep your car running and driving smoothly in the extreme Arizona climate and terrain. Cars made prior to the 1990?s had very different fuel and exhaust systems which did not utilize the technology used in today’s cars, therefore many of today’s mechanics aren’t capable of working on them. We will also be happy to inspect a vehicle before you purchase, enabling you to make the best choice. Classic cars have become a serious investment, often continuing to increase in value as time goes by. You can depend on Scottsdale Muffler & Automotive for all of your vehicle restoration and customization needs. The technicians at Scottsdale Muffler and Automotive talk about the best classic car restoration shops in Scottsdale! Here is a blog based on car enthusiasts that are dedicated to acquiring classic cars. Scottsdale Muffler was honored to have the opportunity to restore this beautiful car and have it featured at this well known event. 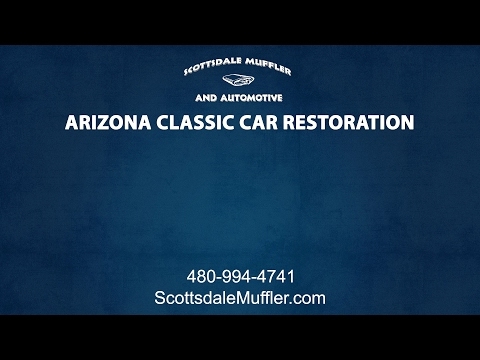 Check out the latest classic car restoration project by Scottsdale Muffler & Automotive.